The owner of the longest full name in baseball history, Calvin Coolidge Julius Caesar Tuskahoma McLish passed away August 26, 2010. He was 84. 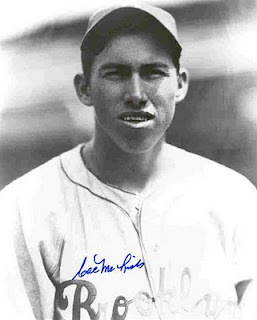 Cal McLish made his debut in 1944 at the tender age of 18 with the Brooklyn Dodgers during World War II straight out of Central High School in Oklahoma City. He missed the subsequent season due to his own military service; however, he later played 15 seasons in the majors with six additional teams, the Cleveland Indians, Philadelphia Phillies, Pittsburgh Pirates, Chicago Cubs, Cincinnati Reds, and Chicago White Sox. He appeared in the 1959 All-Star game where he earned a save, pitching the final two scoreless innings for the victorious American League squad. After his playing career was finished, he was a major league pitching coach for 16 seasons and then went on to become a scout and an instructor, as recently as 2005 with the Seattle Mariners.